Only recently one of the longstanding “truths” of protein anabolism has been busted (learn why the acute muscle protein synthesis response matters more than prev. thought). And now, a new paper in the Journal of Strength and Conditioning Research (Mangine. 2016), appears to suggest that the lack of effect of exercise induced hormone elevations may have been misunderstood, too. In the conclusion of their study, Mangine et al. point out that the previously used “[t]raditional statistical measures do not adequately assess the relationships between multiple variables that exist across time” (Mangine. 2016). In order to overcome this problem, their study used what the scientists call a “unique method for analyzing these types of relationships without the need for transforming data”; and – first things first – their the PLS-SEM analysis (details below) shows: “baseline muscle size and the hormonal response to resistance exercise are related to muscle hypertrophy following 8 wks of training (Mangine. 2016). Figure 1: The scientists ,odel for the relationship between changes in muscle size and the endocrine response to resistance exercise predicts influence of all hormones on muscle size and vice versa(! ); RF_CSA = Rectus femoris cross-sectional area; RF_MT = Rectus femoris muscle thickness; VL_CSA = Vastus lateralis cross-sectional area; VL_MT = Vastus lateralis muscle thickness; WK1 = Week 1; WK8 = Week 8 (Mangine. 2016). 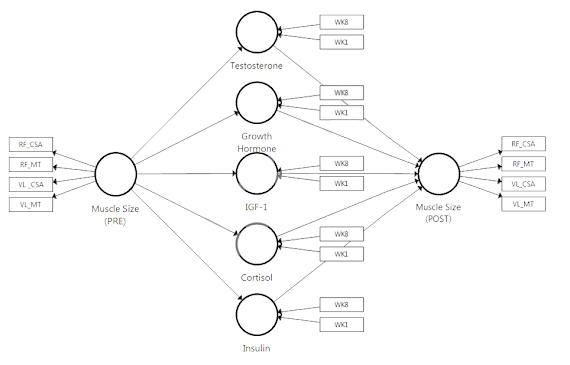 Moreover, the data from the Kennesaw State University, the University of Central Florida and the College of New Years appears to suggest that the often derided exercise-induced post-workout (PWO) increases in testosterone concentrations may be the most important agent in the hormone quintet of testosterone, cortisol, growth hormone, IGF-1, and insulin that is going to react to every intense resistance training study. Figure 2: Sign. associations between PWO hormone levels and lean mass, as well as fiber size increases (West. 2012). That’s surprising in two ways: (A) the majority of previous studies refuted the existence of a practically relevant link between the amount of muscle you will gain and the change in hormone levels, altogether. And (B) you will remember that my hitherto favorite study on the “[a]sociations of exercise-induced hormone profiles and gains in strength and hypertrophy in a large cohort after weight training” by West and Phillips (2012) showed in a large cohort that – if there is any link between the PWO hormone response to resistance training and the changes in muscle size it would be a link to growth hormone (GH) and cortisol (see Figure 2). 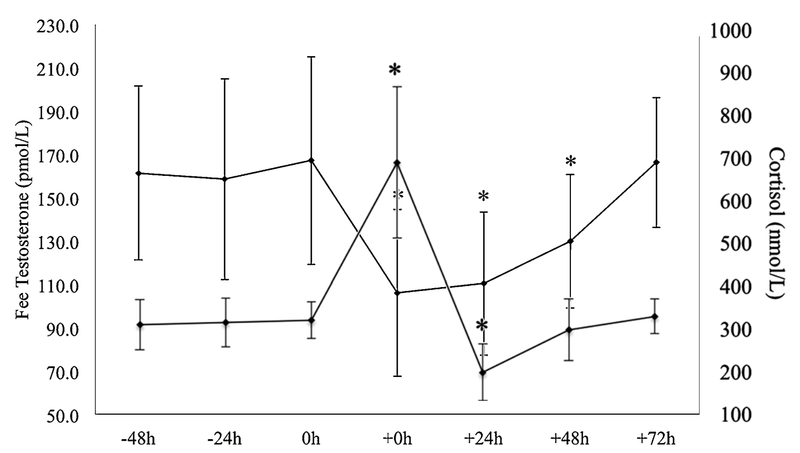 Free testosterone (upper line) and cortisol (lower line) levels before and after exhaustive endurance exercise in trained young men (Anderson. 2016). Excess cardio cannot, it will ruin your testosterone levels and (surprise) 24h post also your cortisol levels: The data in the figure on the left hand side was recorded in a recent study by Anderson et al. (2016) who observed that the full recovery of free testosterone and cortisol after an exhaustive endurance exercise session (prolonged exercise run on the treadmill until volitional fatigue, running at 100 % of ventilatory threshold (VT), within 3 % – 75 minutes) will take 48h – even in endurance trained fit, young men such as the 12 subjects (VO2max 66.3±4.8 ml/kg/min, age 22.8 ± 3.1 years, body fat 11.0 ± 1.4 %, training 7.1y) Anderson et al recruited. That’s obviously significantly different from what we see in the Magine study, at hand, where the likewise previously trained subjects completed at least 28 resistance training sessions (~90%) of an 8-wk resistance-training program (4 sessions/wk) that included six upper- and lower-body exercises during each session, under supervision of certified strength & conditioning specialists. “significant amount of information [that] is lost when using either of these statistical procedures for assessing the relationships between concepts that exist across time (i.e. hypertrophy, multiple endocrine responses) because the statistics can only assess the relationship between two sets of values” (Mangine. 2016). “[…] a variance based procedure that utilizes bootstrapping to statistically assess the relationships between multiple latent variables that are developed from several collected indicator variables [which has] been used to assess relationships within the biomedical sciences [already… even though] it has not yet been used to assess the relationships between the post-exercise endocrine response and muscle hypertrophy” (Mangine. 2016). For it to work, the authors obviously have to assume that “the related variables were collected without systematic or random error” in their experiment that included pre-tests (PRE) of measures of muscle size (thickness and cross-sectional area) of the vastus lateralis and rectus femoris in 26 resistance-trained men who were randomly selected to complete a high-volume (VOL, n=13, 10–12RM, 1-min rest) or high-intensity (INT, n = 13, 3–5RM, 3-min rest) resistance training program while following a food-log controlled diet that was supplemented with a standardized supplement containing ~235 mL of chocolate milk (170 calories; 2.5g Fat; 29g Carbohydrate; 9g protein) or Lactaid® (150 calories; 2.5g Fat; 24g Carbohydrate; 8g protein) to each participant immediately following each workout. Another argument that “testosterone may count” comes from a previously discussed, but in my humble opinion largely overlooked study by Beaven et al. (2008) whose study into the correlation between the individual testosterone response to a certain workout style and the subsequent gains subjects in a randomized cross-over design study made also suggests that “testosterone counts”. Sounds intruiging? I know, but the corresponding SuppVersityarticle from 2013 went almost as unrecognized as the original paper that was published 5 years before in the Journal of Strength and Conditioning Research – the same journal in which Mangine et al. have now published the results of their study. Blood samples were collected at baseline, immediately post-exercise, 30-min, and 60-min post-exercise during weeks 1 (WK1) and 8 (WK8) of training and testosterone, growth hormone [22 kD], insulin-like growth factor-1, cortisol, and insulin levels were evaluated using area-under-the-curve (AUC) analyses of the blood values, based on which the scientists were able to identify the relationships between muscle size (PRE), AUC values (WK1 + WK8) for each hormone, and muscle size (POST) “using a consistent PLS-SEM algorithm and tested for statistical significance (p<0.05) using a 1000 samples consistent bootstrapping analysis” (Mangine. 2016). Figure 3: Actually significant was only the link between the effect of the muscle mass before the study and the testosterone response and the testosterone response on the muscle mass after the 8-wk study (Mangine. 2016). The model the scientists developed was capable of explaining 73.4% (p<0.001) of variance in muscle size at POST and revealed “ignificant pathways between testosterone and muscle size PRE (p=0.043) and muscle size at POST (p=0.032) were observed. Table 1: In contrast to what you may have expected, there was no sign difference in the way the hormones effected the outcomes of the 8-wk resistance training study between the high intensity and volume arm (Magine. 2016). 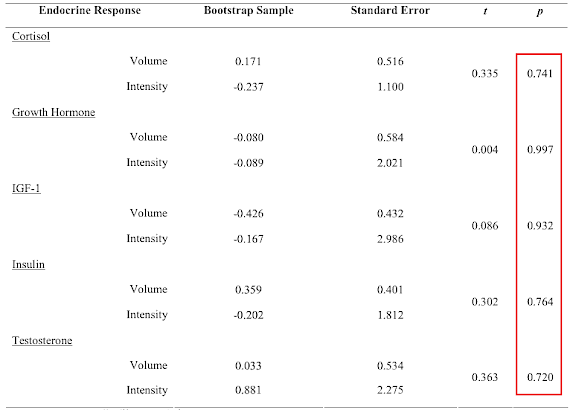 And while the ability to explain muscle size at POST improved when the model was analyzed by group (INT: VOL: p<0.001), the data in Table 1 goes to show you that the researchers found no group differences between the intense low volume and the moderate intensity high volume training. This in turn suggests that the link between muscle size and post-exercise increases in hormone levels – especially the effects on testosterone – are universal and do not dependent on the training type (volume vs. high intensity), as previous studies that argued in favor of volume training based on its more pronounced effects on the hormone response to exercise suggested. Bottom line: I would like to point out that the study at hand does not provide sufficiently reliable evidence to say that Mangine, et al. had ‘proven that the post-workout testosterone increase had a mechanistic effect on your muscle gains’. 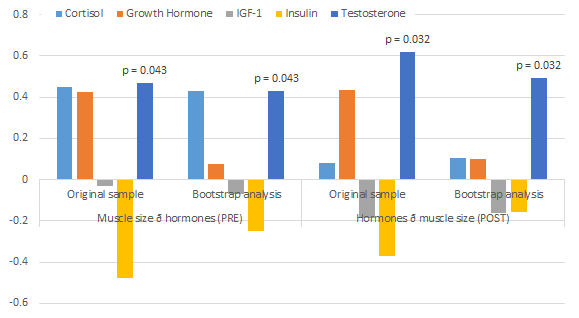 What it does show, however, is, just as the scientists say, that “[e]xercise-induced testosterone elevations, independent of the training programs used in this study, appear to be related to muscle growth” (Magine. 2016, my emphasis in the quote). This is in contrast to previous studies, where the pre-tfiraining correlation between muscle mass and thus testosterone levels had not been accounted for. The scientists’ partial least squares regression structural equation modeling (PLS-SEM), however, is eventually just “statistical shenanigan”. Therefore, its impressive explanatory power of 73.4% of the variance in muscle size following 8 wks of resistance training is a neat figure, but no proof of a mechanistic link. Furthermore, one has to be careful to falsely single out testosterone among the five hormones that were assessed. After all, restricting the model to T, which was the only significant hormonal correlate of muscle gains, reduced the explanatory power of the model by only 30.8%. This leaves the rest of the hormones with an explanatory power of 42.6% (all statistics, obviously ;-). To say that GH, IGF-1, insulin and cortisol had ‘no say’ in skeletal muscle hypertrophy is thus just as unwarranted as the previously hinted at (false) conclusion that the study at hand would provide the long-sought definitive evidence of the muscle building effects of exercise-induced, natural testosterone surges, i.e. the temporary elevation of T-levels after a workout | Comment! Ahtiainen, Juha P., et al. “Muscle hypertrophy, hormonal adaptations and strength development during strength training in strength-trained and untrained men.” European journal of applied physiology 89.6 (2003): 555-563. Beaven CM, Cook CJ, Gill ND. Significant strength gains observed in rugby players after specific resistance exercise protocols based on individual salivary testosterone responses. J Strength Cond Res. 2008 Mar;22(2):419-25. Mangine, Gerald T., et al. “Exercise-Induced Hormone Elevations Are Related To Muscle Growth.” The Journal of Strength & Conditioning Research (2016). McCall, Gary E., et al. “Acute and chronic hormonal responses to resistance training designed to promote muscle hypertrophy.” Canadian Journal of Applied Physiology 24.1 (1999): 96-107. Walker, Simon, et al. “Effects of prolonged hypertrophic resistance training on acute endocrine responses in young and older men.” Journal of Aging & Physical Activity 23.2 (2015). West, Daniel WD, and Stuart M. Phillips. “Associations of exercise-induced hormone profiles and gains in strength and hypertrophy in a large cohort after weight training.” European journal of applied physiology 112.7 (2012): 2693-2702.